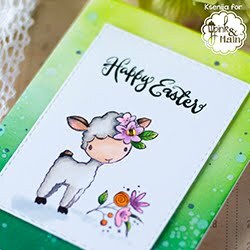 When it comes to making seasonal cards, it is handy to have a card kit with all the necessary supplies: card stock, a themed set of stamps, patterned paper and embellishments. 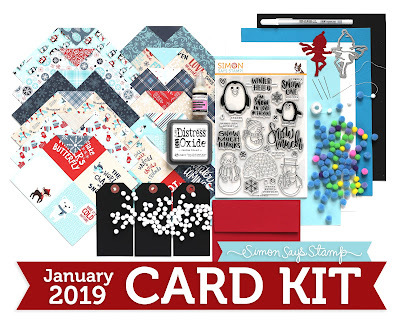 I finally got my hands on the Simon Says Stamp January 2019 Card Kit. I was travelling during the Holiday Season and it was waiting for me in my post office. 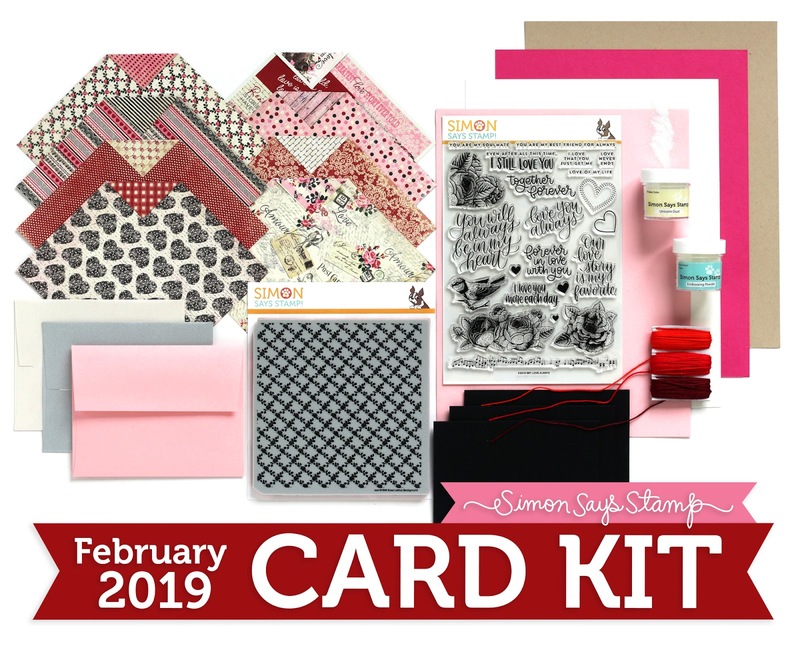 I know that today it is sold out at Simon Says Stamp, but main supplies are available for purchase separately. 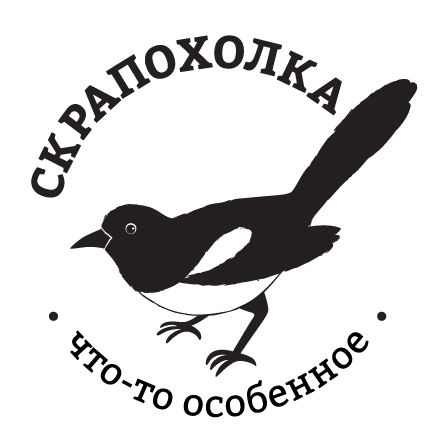 International postal delivery takes a long time and I did not have some of my crafty friends' addresses. 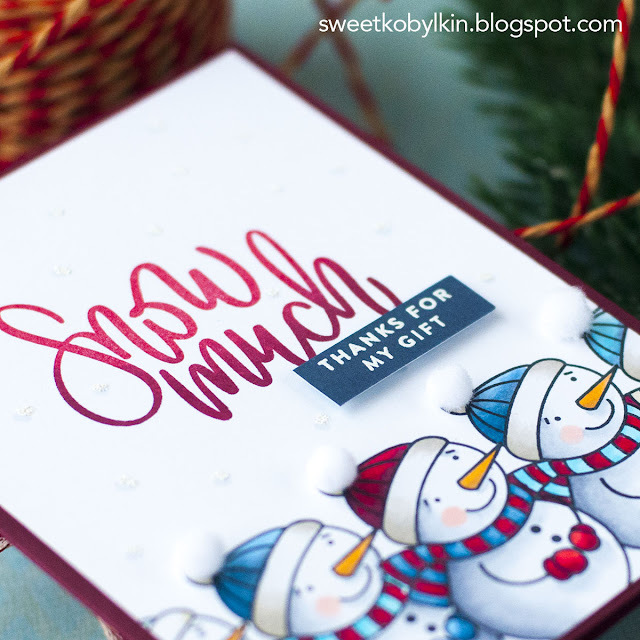 This month I am going to make Winter Thank You cards in response to some of the Holiday greetings I have received. I made this card specially for one of my crafty friends who has sent me a beautiful set of stamps along with a gorgeous card. I am very thankful to her, but let this be a surprise for her too. 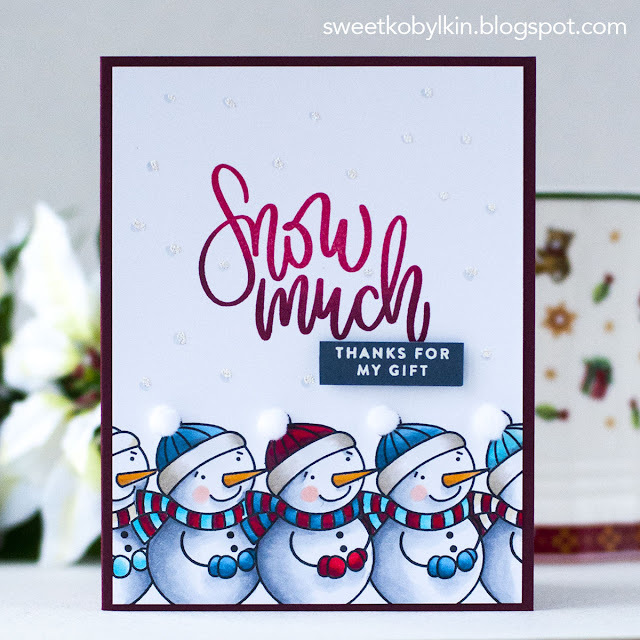 To make my card I started with stamping a row of adorable snowmen using a stamp from the Simon Says Clear Stamps Set SNOW MUCH ( SSS ) in black alcohol marker friendly ink and the Simon Says Stamp MASKING PAPER ( SSS ). The snowmen are coloured with Copic Skecth markers. Next, I stamped Snow much from the same set of stamps using the Ombre Stamping Technique. 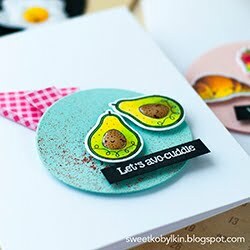 To add a sparkle and a subtle texture to my card's panel I drew dots with Copic Sketch marker in C1, then added dots with the EMBOSSING INK PEN ( SSS ), sprinkled the 3D embossing powder and heat set the dots. To finish off the sentiment for my card I heat embossed Thanks For My Gift onto a dark blue paper from the CELEBRATE WINTER Paper Pad ( SSS ) included in this Card Kit. I find it convenient if there is a couple of punny sentiments and several phrase builders included in a set. 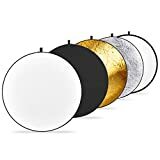 The Snow Much set contains phrase builders for various occasions to express gratitude and love. 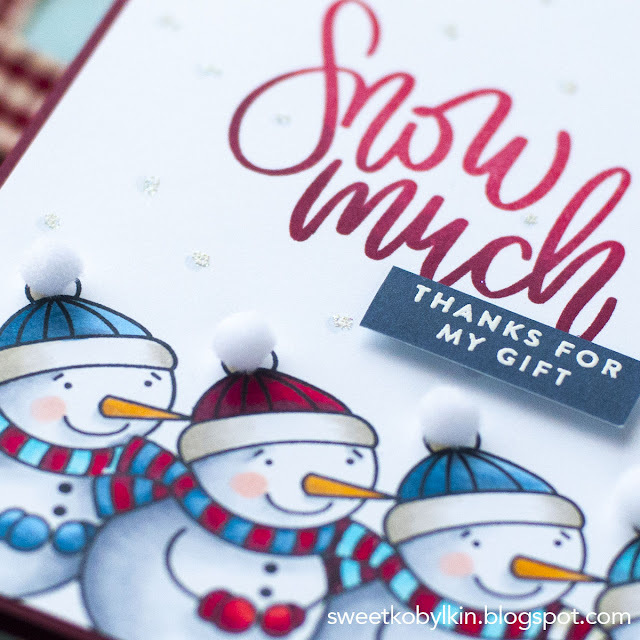 To complete my card I glued the panel onto a dark red card note, popped the embossed phrase up with a piece of the Copic X-Press It Double Sided FOAM ( SSS ) and adhered four white pom poms which were also included in the kit. On January 14, Love Always February Card Kit has been released. I look forward to receiving it soon. I believe it will work well with the Ornate Love dies I have in my stash. 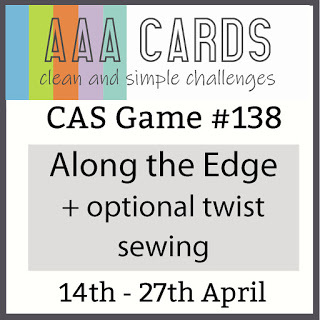 Isn't it convenient to get all the necessary supplies for several cards in one box and to try out new goodies, is it? 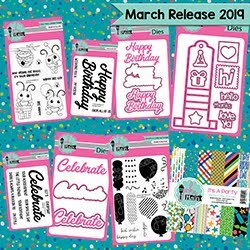 I am curious about the new Simon Says Stamp Exclusive Unicorn Dust Glitter and Authentique 6 x 6 ROMANCE Paper Pad ( SSS ). 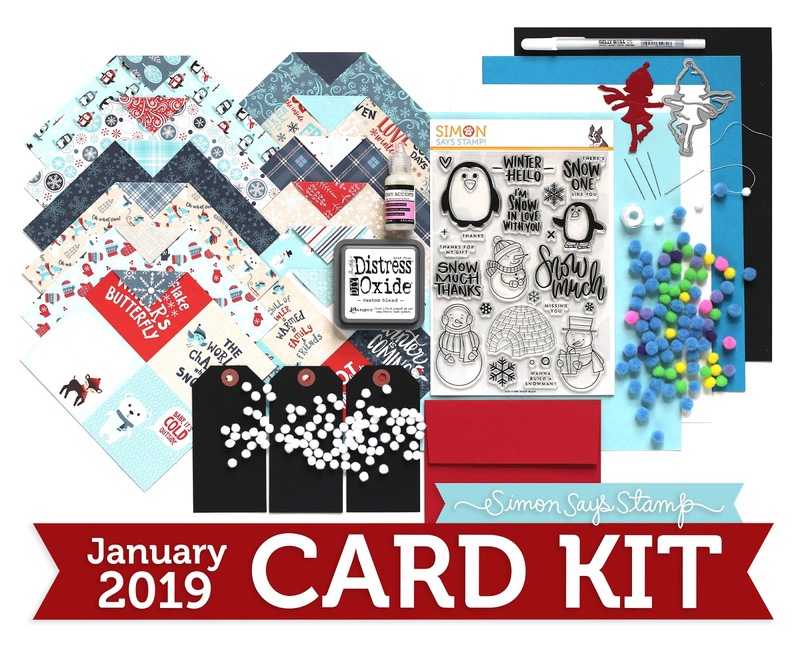 Usually card kits are sold out rapidly. 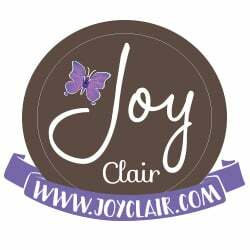 To receive your kit without delays you can subscribe at the reduced price of 29.99 USD plus postage. 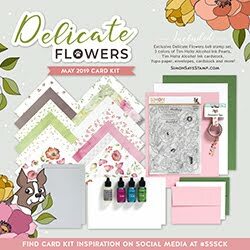 Without subscription the Love Always card kit is available now for 34.99 USD. I LOve your Conga-line of Snowmen!! !